Surrey County Council believes that every child in Surrey should have the opportunity to reach their potential and that the best place for children to achieve this is within their own families. Whilst many children will do that without our support, some will need help. That might be because of extra needs they have, their family circumstances or problems they are dealing with. We want to help these children, and their families, as soon as we can. We also know that we haven’t been doing this well enough. Ofsted inspected our children’s services earlier this year and told us they were ‘inadequate’. That means we haven’t been keeping some children and families safe and giving them the right help when they need it. And we have financial problems. The Government is giving us less money even though more people need our help. So we need to make sure that the money we have makes the biggest difference to the children and families who need support the most. We think the best way to do this is by helping families to become more resilient. That means they will be able to cope with change and bounce back when difficult things happen. Below is more information about how we would do this and the changes this would mean for children’s centres. After that there are questions we’d like you to answer to tell us what you think about our proposals. How will we help families become more resilient? Universal – advice and help for all families on things like parenting, health and education. Additional – for families who could use some extra help with something they are finding difficult. It could something like managing money, relationships or coping with the loss of a loved one. Intensive – for families who want help in quite a few areas of their lives or have really tough problems to cope with. They could be looking after someone with a disability or whose behaviour is hard to handle. They could have been out of work for a long time or the children haven’t been going to school. Specialist – for the small number of families who legally must receive help, so we put together a statutory plan for them. That could be where children have been neglected or abused, or where families are involved in things like crime or drugs. We believe that if families get additional or intensive support, things will get better for them and they won’t need specialist services. Everyone who works with them will come together to find the best way to help a family and try to stop problems before they happen. They’ll be there to help when and wherever it’s needed. Doing things in this new way will mean changes to the services that children, young people and families use at the moment. We’ve looked first at children’s centres and then we’ll look at youth work and youth centres. So we’ll want your thoughts on that area when we do the phase two consultation next year. How would children’s centres change? Currently there are 58 children’s centres across Surrey mainly helping families with children aged 0-5 years. They welcome all families in their area but have already started to offer services that help families who are most in need. To build on this, we think that children’s centres should give more help to the children that need it the most and also offer support to the whole family, particularly families with children aged 0 – 11. This would mainly be the additional or intensive support that we mentioned earlier. We also think that children’s centres should also be the place where families can get support from other services such as health visiting, midwifery, citizen’s advice and support with housing and employment. To make sure we spend money on those who need it the most, we think we should have centres in areas with the highest number of children living in homes where no-one works or there isn’t much money coming in. This will mean having 21 main centres with at least one in each of the 11 districts or boroughs in Surrey. There will also be smaller centres that will offer fewer services but there will be places where workers who are supporting families can meet with them. We don’t think we should have mobile centres any more as they are expensive to keep on the road. But outreach workers will still support families either in their homes or through various group activities or courses. They will also support any families in need who don’t live near a centre. For this new plan to work it’s likely that some of the universal support mentioned earlier will no longer be offered by children’s centres. 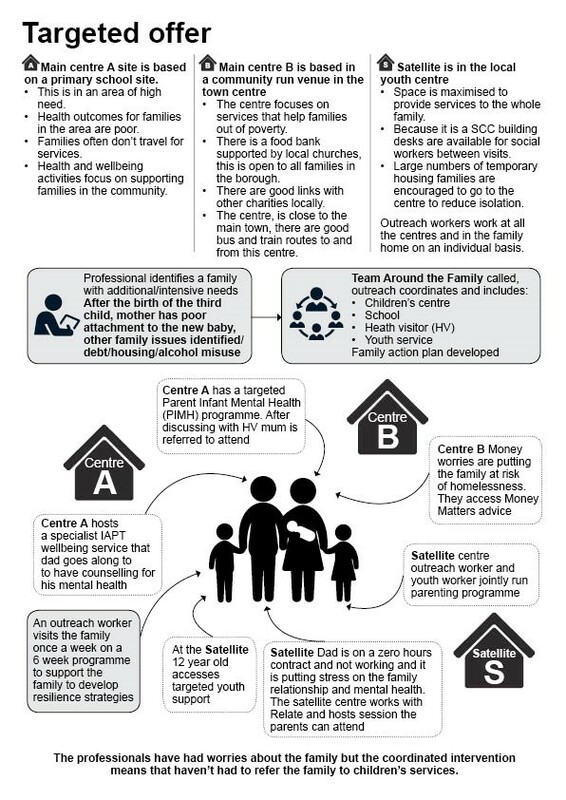 So we want to know how you think the centres could help create more resilient communities where families support one another through the normal challenges of parenting and family life. We also think it would make sense to have a new name for children’s centres as they’ll now offer help to families with older children too. We have some ideas and would like to know what you think about them or if you have any other ideas. Later in the questionnaire there will be detailed descriptions of the proposed changes in each borough and district. If, however, you would like to read more detailed information about what we are proposing before answering the questions below, you can find it on our website surreycc.gov.uk/consultations. You can also pick up a copy at your nearest children’s centre or library, or you can call 03456 009009 and ask for it to be sent to you. If you wish to see where the current children's centres are located, click on the relevant borough map listed below. Otherwise continue to the questionnaire. Our consultation period runs from Tuesday 30 October until Friday 4 January 2019. This consultation has now closed. We are grateful for the time people have taken to provide their feedback. It is being carefully reviewed and will help shape recommendations to be considered by Surrey County Council’s Cabinet on Tuesday 29 January. Please check the consultations page on our website for further updates after the meeting.